Now I'm not much of a shopper, but when I was planning my trip to London, I knew I wanted to pay a visit to Selfridges, the storied department store that is the second-largest shop in the UK and whose Oxford Street doors have been welcoming customers for over 100 years. 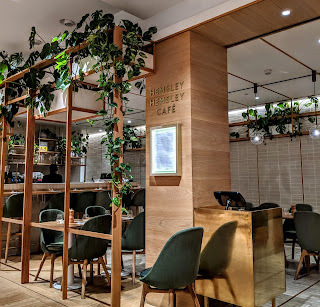 While part of my visit was motivated by seeing the spectacle of Selfridges, I was also motivated by the lure of Hemsley + Hemsely, a cafe nestled in the third floor that serves food free from grains, refined sugars, and hydrogenated vegetable oils. I wasn't quite sure what to expect when dining out in the middle of the swimsuit section of an astonishingly expansive department store, but it certainly wasn't the carefully crafted, almost calming experience I had. With a health-conscious menu and calming vibe, this was among one of the most relaxing meals I discovered in London. Hemsley + Hemsley Cafe's menu is expansive, and helpfully identifies vegan, vegetarian, and vegetarian options. The menu is seasonally-inspired, and does change periodically to incorporate the season's freshest flavors. 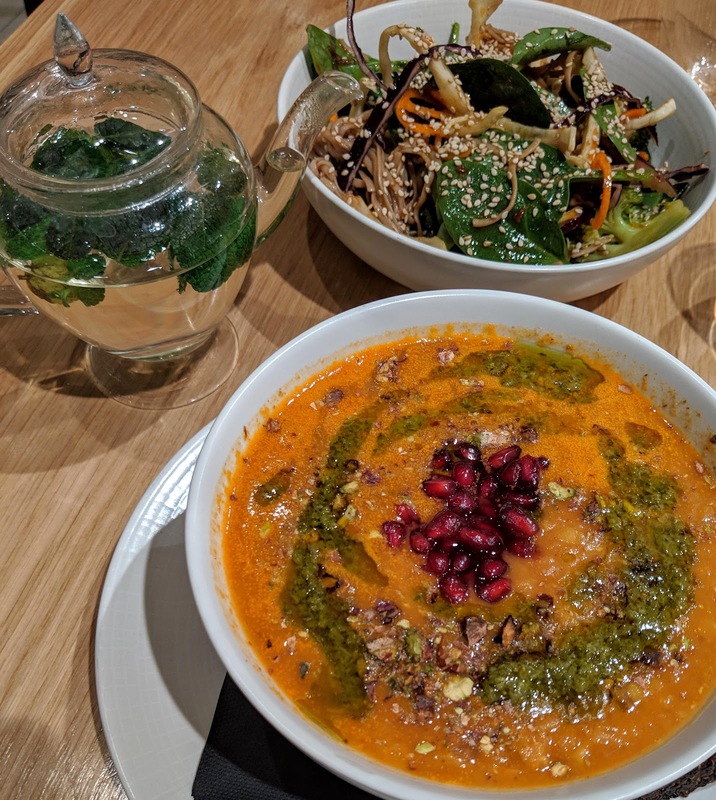 It was difficult to narrow down exactly what I wanted to order, but after much deliberation, decided to order a bowl of their spiced Syrian soup with a side of their soba noodle salad, joined with a hot pot of fresh mint tea. When my food came out, I was impressed with the generous portion of each dish and their beautiful presentation. 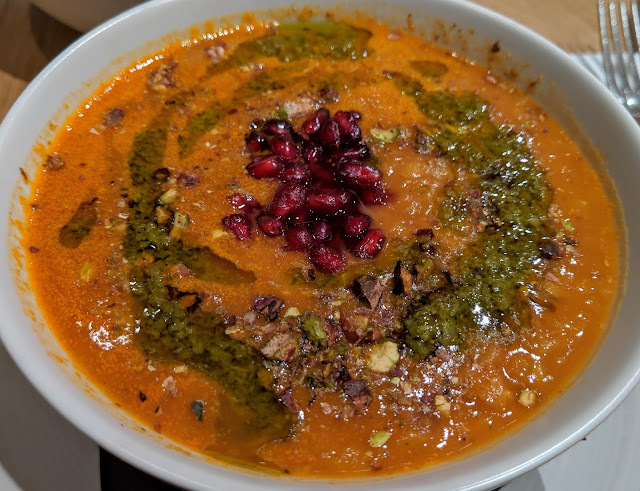 The spiced Syrian soup was vegan, and had lentils as its base. Accompanying those were tomatoes and fresh herbs, with Aleppo chili and cumin leading the flavor profile of every spoonful. The soup was topped off with a herb-infused olive oil and tangy pomegranate seeds, which added contrasting flavors which elevated the soup from good to truly great. Hearty and soothing, this soup was sheer perfection on a chilly February night. 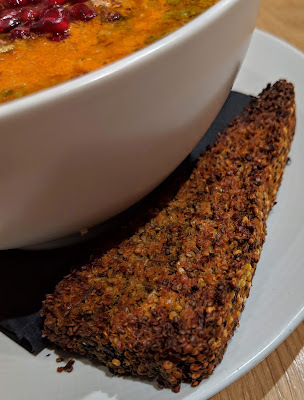 The soup came accompanied with Hemsley + Hemsley's carrot and quinoa crispbread. A little underwhelming in looks, it more than made up for in flavor, with a deliciously satisfying crunchiness and lovely whole-grain flavor. Its was a novel take on gluten-free "bread" and a perfect pairing for the soup. The soba noodle salad provided a contrast in flavor profile, leaning away from comfort food heartiness to a more refreshing, light take on noodles. 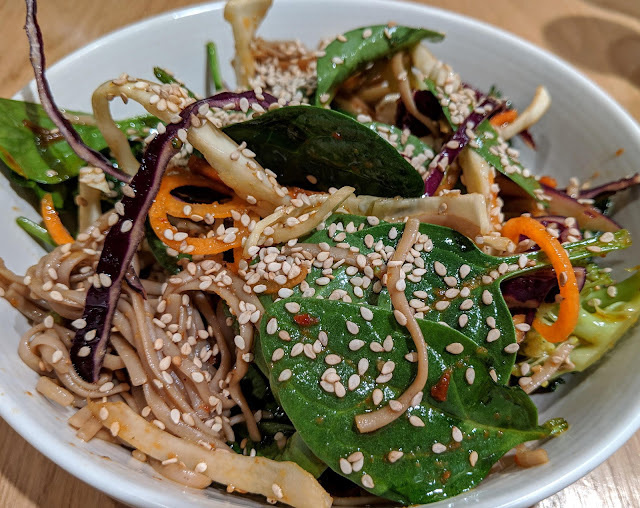 The base of the bowl were buckwheat noodles, which were tossed with spiraled carrots, purple cabbage, spinach (and other greens), and sesame seeds, all tossed with a tamari-lime dressing. I loved the bold flavors of this dish, they were a fresh take on Asian fusion fare. I can say without a doubt that this is the most fun I've had eating my veggies in a long time. With such a colorful and flavorful dish, it's proves that eating healthy doesn't mean compromising the "fun" factor! I am so happy I paid Hemsley + Hemsley a visit while in London. They were definitely a dark horse of my dining experiences abroad, I was definitely not expecting as incredible an experience when it came to the food and hospitality of the staff. Sure it's a little weird to adjust to dining in the middle of a department store, but at first bite everything else seems to simply melt away as you are enveloped in the flavor of the food. If you are in search of uncompromising and unapologetically healthy and delicious food, Hemsley + Hemsley should rank high on your sightseeing priorities list, and scores major points for being dedicated gluten-free and friendly to other special diets. Also, I was thrilled to discover that Hemsley + Hemsley has shared a recipe for their spiced Syrian soup on their website. While I don't think I can fully capture the magic of this dish in a homemade version, at least I'll have a way to recreate it in anticipation of my next visit.